Health & Swellness » Should you be getting your vitamins through VitaminWater? Should you be getting your vitamins through VitaminWater? 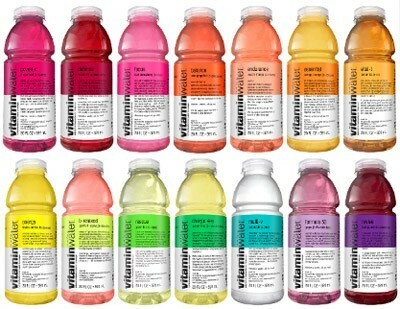 South of the border, there’s a consumer group causing a commotion over the VitaminWater’s health claims. And in answer to the question above, no, you should be getting your vitamins through a balanced diet–but you already know that, my Health & Swellness readers, right? Sure, I drink VitaminWater from time to time. I’ve mentioned before that I’m not a big water drinker (still working on picking up that habit again), but VitaminWater is flavourful enough to satisfy me. From the many dietitians I’ve interviewed and past articles I’ve written, I know this drink is providing me with vitamins I am probably not deficient in–along with extra calories that plain old water wouldn’t. But I don’t guzzle it regularly as my source of vitamins (I’m making veggie-filled meals for that), and the occasional one I do have is fewer calories than a soft drink I might otherwise drink. I like the vitamins water a lot. The one’s I like are power -C and energy-tropical citrus and essential revive and kiwi, restore and d – fence , ignite , triple antioxidant and spark. Sobe water to like citrus energy. The Corporation Stocks: For Second Investment Opportunity on Exsitence Shares of Sharesholders. The formula would be under Profolios and Law Firms whom in Agreement with Second Proposal for whether New Shares Holder or Previous Shareholders. The Previous Shares Holders Invested 100%. Now, New Shares are Second Investment of Up to again 100%, therefore, if achievement in Previous was one million sales of Shares for Second Opening again we open One Million + One Million = two million available shares for new or existed members. Consequently, if the price was each Shares for $5,000.00 selling property shares of one million dollars could be as indicated $1,000,000.00/$5,000.00= 200 Shares Holders. In fact, Now, for 2,000,000 Shares available to Make Pro Folios The Each Share would be $5,000.00+$5,000.00 =$10,000.00 dollars Since we have gone through to 2,000,000. Shares of 200% Added to Availabilities, therefore, 2,000,000. Shares would be on Pro Folios 2,000,000 ($10,000.00) = 2^10 or $20,000,000,000.00 the end of selling and closing the new investment of Shares buyers. The Company or Firms of Pro-Folios Must not accepted any other formula to against the Profits Earings of the Corespondents of Vitamin Waters as well. In my gratitude as licensee of US -Market wishing a greaters achievements expectations in Worldwide successful and advancement Industry’s of California State USA-NCA. ( AKRAM BANAI CA-USA-March 22, 2019.) Yours truly, Mrs. Akram Banai, US-Market Licensees. UCLA.EDU Macroeconomics Licenses Employed and as we’ll Owner of American Business Company…President 1.